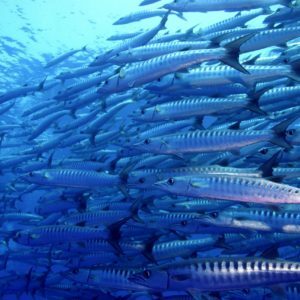 Most recreational divers have heard of the Ribbon Reefs located off the coast of Cairns in the Great Barrier Reef Park and such dive sites as Cod Hole, Cod Wall, The Pixie Reef and Steve Bommie. To many these represent the premier diving conditions and sites. Twenty to thirty meters of visibility, warm waters, little or drift currents, wide range of hard and soft corals with sponges, and an assortment of marine life unmatched anywhere else in the world. Another thing the Ribbon reefs are is that they are remote. Far enough away to be less influenced by the effects of the land and man, however, still close enough that they can be visited. The Spirit of Freedom is one of the few vessels that does call on the Ribbon Reefs. 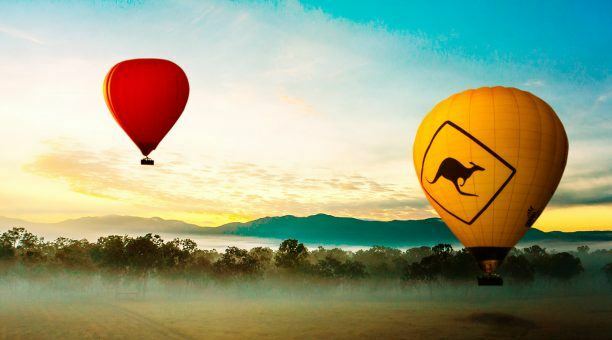 The Spirit of Freedom sails on Mondays from Cairns for a seven day trip that includes the outer reefs of the Great Barrier Reef, the Ribbon Reefs and the Osprey reef out in the Coral Sea. 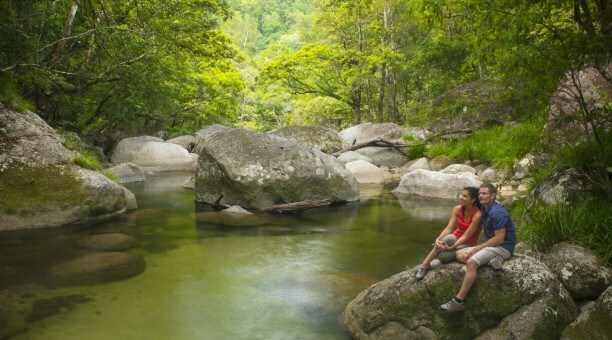 The trip can be taken in segments as a three day cruise up the Ribbon Reefs to Lizard Island or a four day trip from Lizard back to Cairns with a side trip to the Osprey Reef. The Spirit of Freedom is a steel hull 37 metre long 7.2 metre wide vessel designed specificity to cruise and dive the Coral Sea area. She has 11 different cabins able to carry 26 guest with a crew of 10. 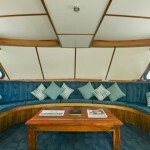 Two of the cabins have ocean views and are located on the top deck while the remainder are on the lower deck. 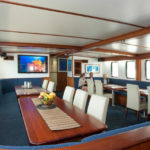 The Spirit of Freedom main deck is the home of the dive deck, dining area and a lounge that is forward. The upper deck, in addition to the two ocean view cabins, is both the bridge deck and the sun deck. The itineraries of the Spirit of Freedom is similar to the Spoilsport of Mike Ball’s Expedition. Both vessels visit the Osprey reef on the four day segment, however, the Spoilsport does it between the Cairns departure and arriving at Lizard island, while the Spirit of Freedom does it after leaving the Lizard Island on the return to Cairns. The Spirit also makes a stop in the outer reefs when it leaves Cairns while all the Spoilsport diving is further north. If you ask ten different divers what was the best dive site during a one week Liveaboard on the Spirit of Freedom you will likely get ten different answers. Each individual will have their own preference and each site has something unique that make it stand out. These sites that are visited really do stand out from sites anywhere else in the world. The Osprey reef is visited on two days with a number of different sites visited during the day plus repeat night dives on a day site. The North Horn site is known for its sharks and more sharks. 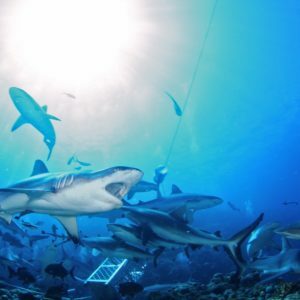 While well known as a dive site it is equally well known in scientific communities as an ideal location to study sharks. Expect to see a large number of sharks of different species. Nearby is the North Horn wall, a perfect dive site along a vertical wall that extends a 1,000 metres DOWN. Sharks including reef and hammerheads, Wrasse, tuna and other pelagic marine life rise out of the depths to also cruise along the wall. The Castle and silver city dive sites are near each other and offer a selection of open caves and bommies. They both offer a shallow lagoon near the deep wall. The dive sites of the Ribbon Reefs are also inspiring. 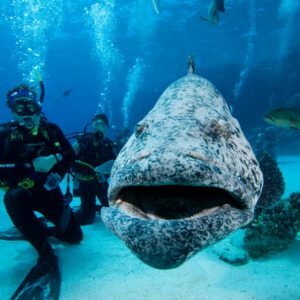 Sites such as Steve’s Bommie and Pixie Pinnacle will have underwater photographers especially macro photographers believing they have witness a glimpse of heaven. While the Osprey reef is best enjoyed by advanced divers the ribbons are great for divers of all skill levels. 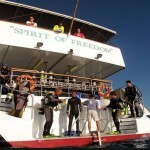 For an life long memory of perfect diving consider the Spirit of Freedom and Coral Sea.